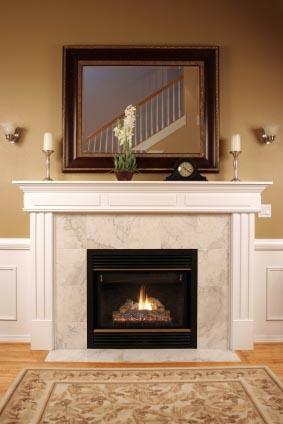 A ventless gas fireplace is a cost-effective and low maintenance room heating option. Many people choose the ventless style because it provides the look of a wood-burning fireplace without the hassle of collecting logs, starting a fire or cleaning up ash debris. It is also the only gas fireplace that does not require exterior ducts. Despite these benefits, the use of ventless fireplaces is controversial and even outlawed in some states because of potential health concerns. Ventless or vent-free fireplaces are a type of gas fireplace and one of the modern alternatives to traditional wood-burning models. Here is what you need to know about ventless fireplaces. Gas fireplaces can enhance a home using less floor space than a traditional wood-burning fireplace. The fireplaces are also less expensive to purchase and install than a wood-burning fireplace with a chimney. Gas fireplaces use propane or natural gas for fuel. Most models can be attached to an existing home fuel source. Ventless fireplaces come in small, medium and large sizes. Gas fireplaces follow the British thermal unit (BTU) rating system like standard furnaces. The BTU rating measures the quantity of heat produced by the gas fireplace. Ventless fireplaces are known for heating a room sufficiently, especially when the model size is compatible with the room size. Small vent-free models generally produce 5,000 to 10,000 BTUs of heat. The larger models can produce up to 25,000 BTUs of heat. The ventless fireplace's lack of an exterior duct can create a moisture problem. The fireplace produces large amounts of water when it burns natural gas. Without a vent, moisture may get trapped in the house and can cause condensation on cold surfaces. The extra moisture may benefit those in a dry environment in place of a humidifier. However, if too much moisture builds up, mildew, fungus or mold may form. Ventless fireplaces have special burners underneath the logs that allow enough air to combust natural gas efficiently and produce a minimal amount of carbon monoxide. Vent-free fireplaces must be equipped with oxygen depletion sensors in order to be approved by the American Gas Association. The sensors measure the amount of oxygen in the room. If carbon monoxide increases and the oxygen in the room decreases, the sensors activate and shut off the gas before the carbon monoxide reaches a dangerous level. Despite the safety mechanism, some states and countries such as California, Massachusetts and Canada, do not allow ventless fireplaces because of the danger of carbon monoxide exposure and oxygen depletion. A person considering the purchase of a ventless fireplace should check state and local regulations. Some cities may require some type of external duct on vent-free fireplaces as a safety precaution. A ventless fireplace may not be the best choice for a person with respiratory health conditions such as asthma because of the potential for poor air quality. If excess moisture leads to mold growth, a person with allergies may suffer an allergic reaction. Ventless gas fireplaces offer homeowners a convenient way to heat a home and enjoy the beauty of a fireplace on a limited budget. Shoppers who want a low maintenance fireplace and don't want to remodel will be attracted to this type of fireplace. However, some shoppers may be discouraged by the fireplace's potential health risk. Anyone who is considering the purchase of a ventless fireplace should learn everything about the fireplaces to make an informed decision. It is also a smart idea to include a carbon monoxide detector in any room with a gas fireplace.